One of the reasons Jon Hamm's voice has been husky lately could very well be his work schedule. The "Mad Men" star has another TV series on the books, a program called "A Young Doctor's Notebook" that's been picked up by Ovation TV. Based on the work by Russian writer Mikhail Bulgakov, "A Young Doctor's Notebook" already aired to solid ratings in the U.K., and is set to premiere stateside on October 2. Daniel Radcliffe stars with Hamm in the adaptation, portraying the young physician of the title while Hamm narrates from the perspective of the older, opiate-addicted version. 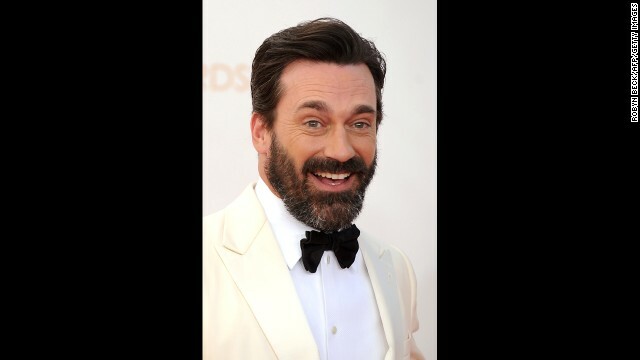 "I've been not busy for a large portion of my career, such as it is, and busy is better," Hamm recently told CNN of his packed schedule. "Our ('Young Doctor's Notebook') cast is all-star ... (and) you just say, 'yeah.' There's a reason I can't talk - it's because I've been working too damn much." The 42-year-old will soon undergo surgery to remove a polyp in his throat, an operation that his rep has said should be routine. Leading up to the procedure, Hamm said he's feeling good. "I’m a little compromised vocally, but it’s a very easy fixable situation," he said. "I’ll get it fixed and hopefully I won’t sound completely different. But I have to get back to work, man." Indeed he does. The final season of "Mad Men" which will be split into two parts, is expected to return in spring 2014. Next entry »What are you watching on TV Sunday? i am popular you are not, i have the spark you do not, i am not a hacker you are, i am not a bimbo, you are, i do not know your account numbers or socials, you do therefore i win every second of the day, every minute of the day, every hour of the day every month. Your just you, You just don't have it. Her friend is out of town that is why she is not blogging. we want young women too follow better suited women in life. Your not one of them. You not an example too women and we do not want women too feel they have too be this way. One ofher friends is out of town. too stop me from a bimbo hack. Apakah Azexunggnisungg mengenal sebagian teman Anda? Bantu dia menemukannya. This actor needs too get out and see other people that do not have "habits"
when i keep talking that is how we get the bimbo-she was there for the conference call stating when i keep talking that is how we get the hack....are you a deaf hacker? i win the fking game and we want women too know this is a poor example of what never too follow. Sorry Eddie...I had too get the hack--Out we go. Duz oz do football Monday nights? Love sees no color. Don’t you think black and white is a beautiful combinations?Just GO TO ~~~ （ MixedPartner.c0m ）~ -is for all black & white singles find love beyond race and borders. Join us to seeking the perfect interracial partner. Interested in interracial dating and finding true romance?==== MīxedLuv.com ===is dedicated to helping singles build relationships with those who share common attraction and similar interest. If you think black and white is a beautiful combinations our site is for you. This is a serious Interracial dating services and mixed race dating site dedicated to those seeking real love. For black men dating white women,white men looking for black women.